With Kegco's Jockey Box Conversion Kit, you can quickly and easily convert a preexisting Igloo or Coleman cooler into an impressive Jockey Box Cooler that is sure to be a hit at your next party, tailgate, or camping trip. This kit comes complete with detailed instructions and all of the high quality draft beer components you'll need for a successful cooler conversion, including a tightly wrapped coil that has been specially designed to fit smaller coolers. All you will need is a 25 quart or larger cooler that can accommodate the 50' stainless steel coil, and a screwdriver, drill, and crescent wrench. You will be drilling a hole in the front to mount the shank and faucet and another in the back for the ice box coupler assembly, which will connect directly to the keg through a jumper line assembly. This tight wrapped coil is designed for use in an ice-water bath to chill beer down to the ideal dispense temperature of 36-38° F. It is 50' in length, the tubing is 5/16" O.D. x 1/4" I.D. 304 grade stainless steel and the coil is tightly wound to fit in narrow coolers. The coil has a 5" diameter and is 8-1/4" tall. Complete your conversion with the optional direct draw kit. 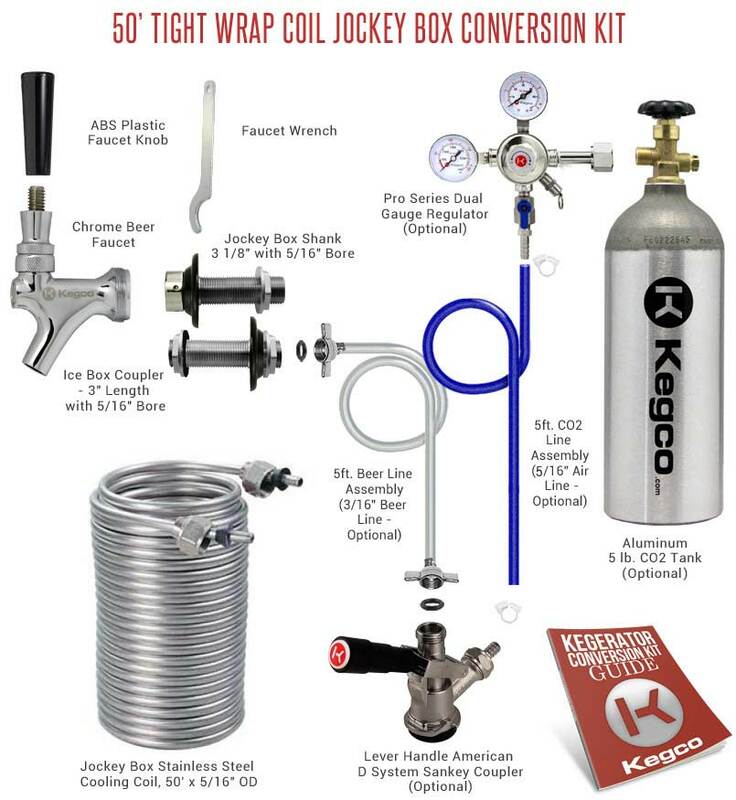 This kit includes everything you need to set up a CO2 Gas system for your jockey box. It includes A Brand New Aluminum 5 Lb. CO2 Tank (Empty), Pro Series Double Gauge Regulator, Lever Handle D System Keg Coupler, 5 Feet of 5/16" Blue Air Tubing and Two Plastic Air Line Clamps.